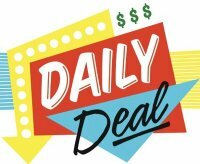 Wired@Home.com Daily Deals are available everyday. Each day, a new deal is made available for purchase until stock is depleted. These are incredible deals, sometimes at or below cost. See this week's current deals below and remember shipping is always FREE on orders over $49!